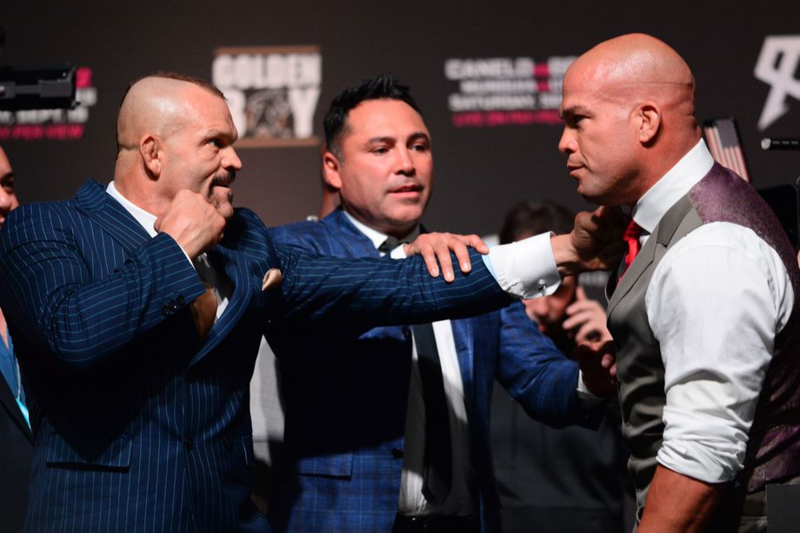 When the third bout between UFC Hall of Famers Chuck Liddell and Tito Ortiz was announced for Golden Boy Promotions, many speculated what type of undercard the event would include, along with the price tag that it would carry. The November 24 show at The Forum in Inglewood, California will mark the first time Liddell has competed professionally in mixed martial arts since he retired more than eight years ago in June 2010. That was after suffering three consecutive losses and being urged by UFC President Dana White to take a seat and walk away from competition. Ortiz on the other hand, is coming off a first round submission win over Chael Sonnen at Bellator 170 in January 2017. Even though Liddell holds two big wins over Ortiz, sports bookies at Canada Sports Betting are uncertain that lightning will strike a third time. While Golden Boy’s Oscar De La Hoya may see visions of dollars signs in his head by booking a trilogy bout between the two rivals, a strong supporting fight card might help back up his thought process. Unfortunately the proposed card, leaves much to be desired for the casual mixed martial arts fan. In the light heavyweight co-main event, Kenneth Bergh (6-0) fights Jorge Gonzalez (14-3). A 160-pound catchweight bout between UFC veterans Gleison Tibau (33-14) and Efrain Escudero (30-13) will take place on the pay-per-view main card, which also features a featherweight bout between Walel Watson (13-8) and Ricardo Palacios (10-1), and a heavyweight bout between Jay Silva (11-12-1) and Oscar Cota (10-1). The cost of the pay-per-view on FITE TV is $49.99. What are the odds that Liddell gets the job done next month in Inglewood?